Lamp Making and Lighting Kits with Candelabra Style Sockets and Candle Style Socket Covers can Quickly and Easily Convert Treasured Pieces and Collectibles into Unique Lighting Accents. Kits include PRE-WIRED Candelabra Style Sockets & Candle-Look Socket Covers. Power Cords exit sockets from the SIDE. Cords Exit from SIDE of Sockets. Cords Exit from SIDE of Sockets..
Mason Jar Lamp Kit. Converts canning jars with 2-5/8" diameter mouth into instant lamps. 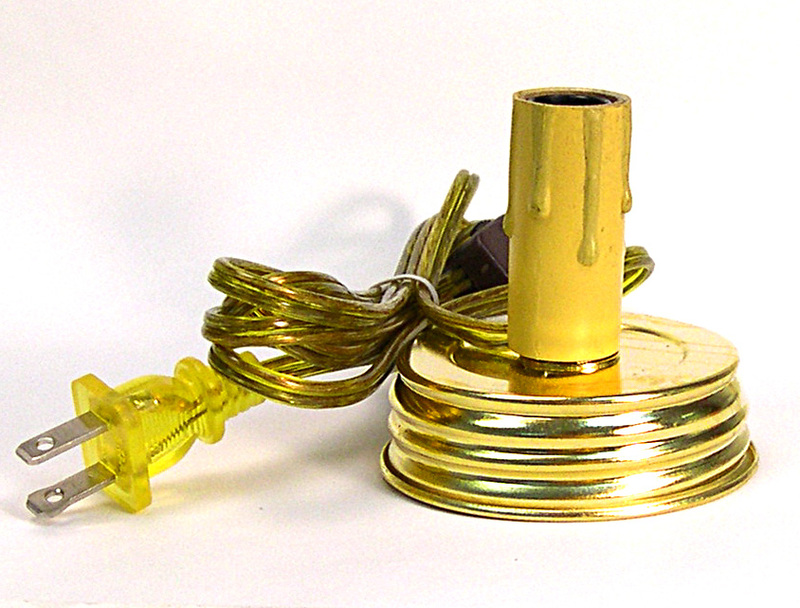 Lid has a bright brass finish, Includes 2"H antique candle-look socket cover. Candelabra size socket is pre-wired and assembled. Transparent gold 6 ft. cord has molded polarized plug and rotary on-off switch. Cord exits from side of socket. For indoor use only. Mason Jar Lamp Kit. Converts canning jars with 2-5/8" diameter mouth into instant lamps. 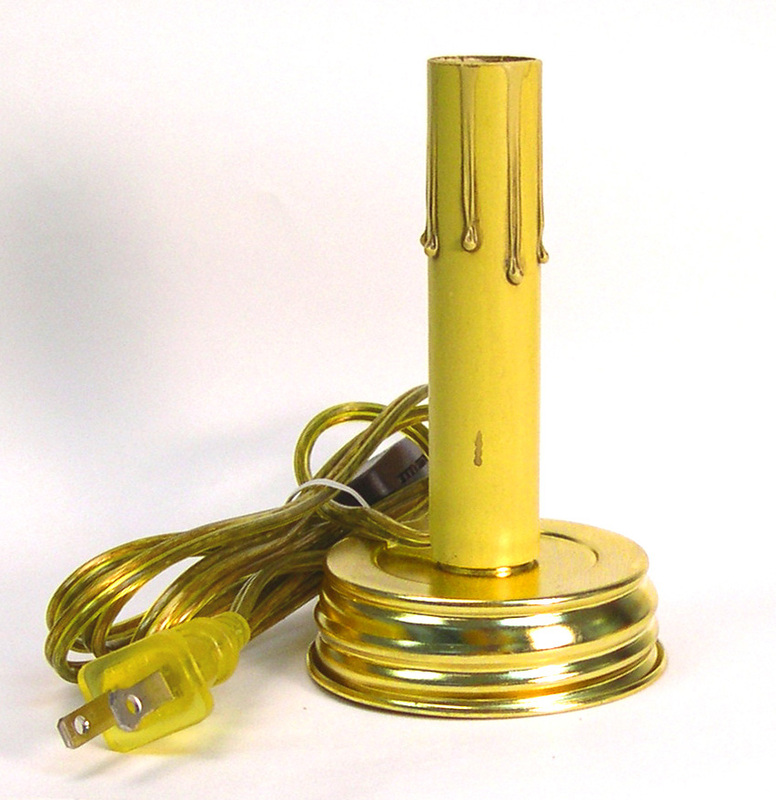 Lid has a bright brass finish, Includes 4"H antique candle-look socket cover. Candelabra size socket is pre-wired and assembled. 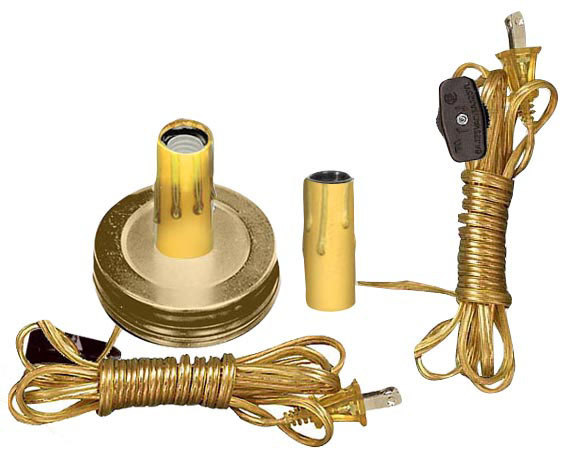 Transparent gold 6 ft. cord has molded polarized plug and rotary on-off switch. Cord exits from side of socket. For indoor use only. Basket Lamp-Making Kit. Fully assembled. Clamps onto basket handles up to 3/8" thick. Candelabra size socket is pre-wired and assembled. 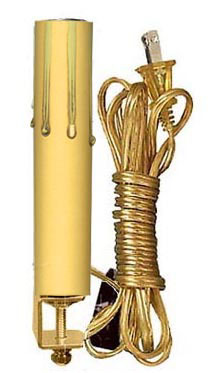 Brass mounting hardware. 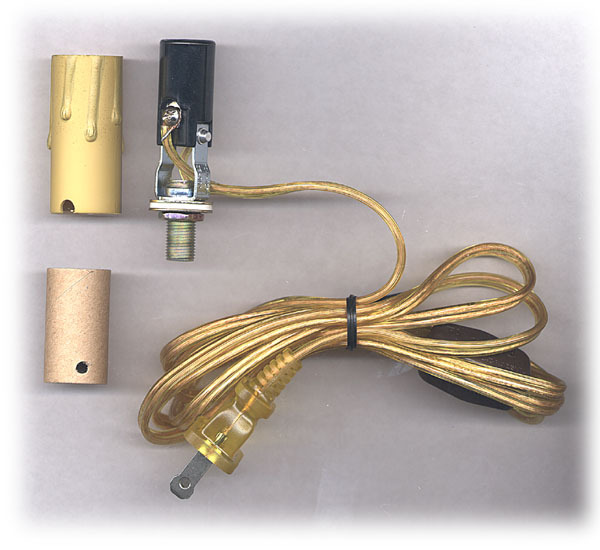 6 ft. transparent gold cord has inline on/off switch and polarized plug. Cord exits from SIDE of socket. For indoor use only. Candle Style Lighting Kit. Candelabra size socket includes antique candle-look socket cover. Socket is pre-wired to 6 ft. transparent gold cord with inline on/off switch and polarized plug. Cord exits from side of socket. Includes mounting hardware which requires 3/8" dia. hole. For indoor use only.